Dr. Carol Burdsal is Managing Director of Grants and Federal Affairs at McAllister & Quinn, where she assists clients to strategically pursue federal funding opportunities. Dr. Burdsal leverages her experience as a former faculty researcher, university grants administrator, and program director at the National Science Foundation (NSF) to provide clients with advice and support to develop relationships, identify appropriate funding opportunities, and apply for funding at federal agencies. 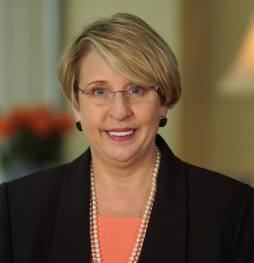 Prior to joining McAllister & Quinn, Dr. Burdsal was Assistant Provost for Research at Bucknell University, where she was instrumental in elevating the profile and efficiency of the Office of Sponsored Projects. As a principal investigator of numerous extramurally funded projects from agencies such as the National Institutes for Health (NIH) and the Centers for Disease Control (CDC), Dr. Burdsal offers a unique perspective to clients – that of a grant-seeking faculty member and an experienced grants administrator at both large, research-intensive institutions and smaller, predominantly undergraduate institutions (PUIs). Before joining Bucknell, Dr. Burdsal served as Program Director at two NSF clusters in the IOS Division of the Directorate for Biological Sciences (BIO): the Physiological & Structural Systems and the Developmental Systems clusters, which support multidisciplinary research at the interfaces of biology, physics, chemistry, mathematics, computer science and engineering. BIO provides about 64 percent of federal funding for non-medical, basic research at academic institutions in the life sciences. Prior to her public service at NSF and following a period of postdoctoral research at the University of California, San Francisco, Dr. Burdsal held several positions at Tulane University, including: Associate Dean for Academic Programs and Associate Dean for Undergraduate Programs at the School of Science and Engineering; Co-Director, Department of Cell and Molecular Biology Master of Science Graduate Program; and Associate Professor, Department of Cell and Molecular Biology. She earned her B.S. in biology from the University of Miami and then trained as a cell and developmental biologist at Duke University, where she earned her Ph.D. in 1990. Dr. Burdsal’s expertise also includes academic intellectual property (IP) issues. A Registered Patent Agent with the U.S. Patent and Trademark Office, Dr. Burdsal advises on the federal regulations that govern IP and assists institutions to develop effective education programs concerning the policies, practices, and practical understanding of the patent process, including best practices for faculty working with offices of technology commercialization. She provides technical and strategic advice on the process of technology transfer on a broad range of topics, including commercialization of IP, the crafting of invention disclosures, and best practices in conducting patent searches and understanding the various types of patent applications. Dr. Burdsal has authored and co-authored numerous presentations and peer-reviewed articles on a broad range of topics in professional journals such as Developmental Biology, the official journal of the Society for Developmental Biology; Development, a leading primary research journal in the field of developmental biology; Developmental Dynamics, a peer-reviewed scientific journal of the American Association of Anatomists, and many others. She has also been a workshop leader and presenter at various meetings of the National Council of University Research Administrators.